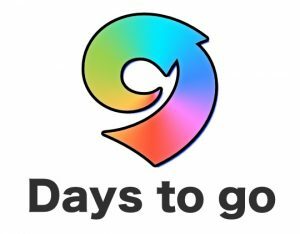 With 9 days to go until the Sunshine Coast Karate Come & Try Day, today we wanted to take a little bit of time to show some gratitude for our teachers and those who have come before us to pave the way for us and future generations. 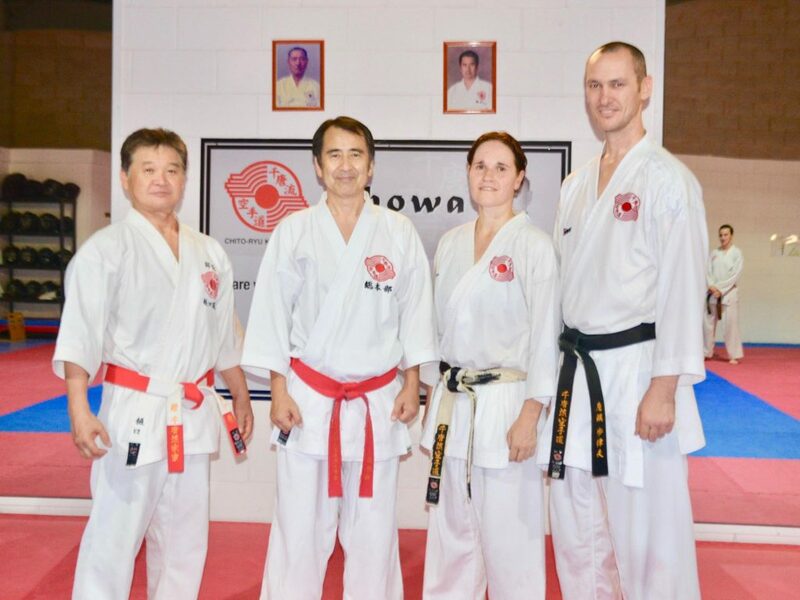 Without them, we wouldn’t be where we are today and sharing Chito-Ryu Karate-Do with the Sunshine Coast. And of course there are countless other Hollywood movies who have featured some amazing martial arts fight scenes. 1980’s martial arts icons: Mr Miyagi & Bruce Lee. Alongside our very own karate master, Sandra Phillips Sensei. 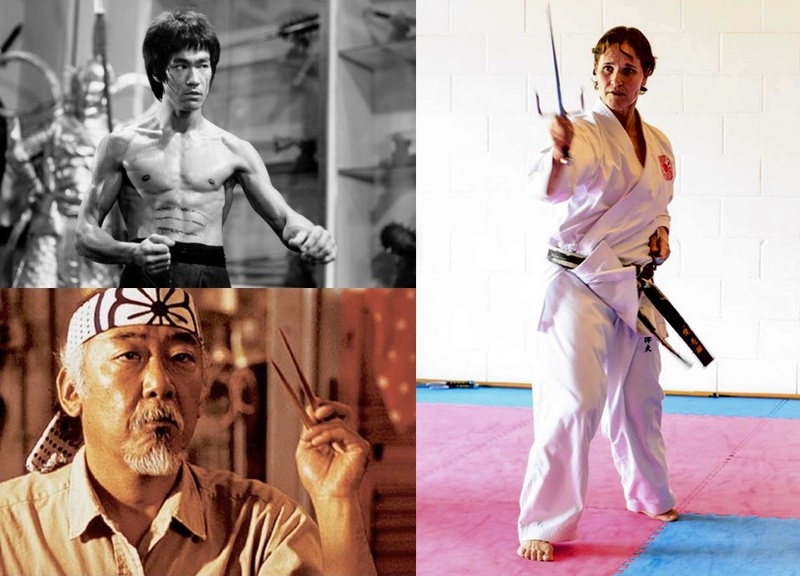 Although the movie industry has been responsible for getting so many people into the martial arts, the reality of martial arts is very different to what’s shown in the majority of movies. And with the martial arts industry being so unregulated, even to this day, just about anyone can open up a dojo. We could have walked into any old dojo and started, but we’re really grateful that we stumbled across Chito-Ryu. The thing we like most about Chito-Ryu is that it’s so deep. We’ve been studying Chito-Ryu for a combined 60+ years (35 years & 29 years), yet in the presence of the people that we’re proud to call our teachers, we still feel like white belts. We’re not saying that we’re hopeless, but we do realise that there is still so much more to learn. Our original teacher of Chito-Ryu, Brian Hayes Sensei is no longer studying Chito-Ryu, but we are very grateful for the foundation that his teachings have provided. The thing that we’re most grateful for though is that he introduced us to our current teacher, Soke Chitose, the worldwide head of the International Chito-Ryu Karate-Do Federation (ICKF). 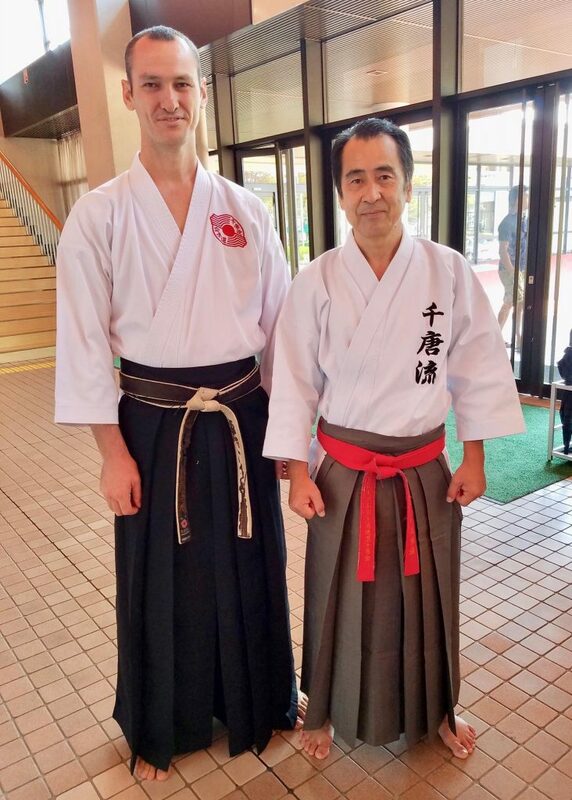 Soke continues a long lineage passed onto him by his father, renowned Okinawan ‘Kake-Dameshi’ (Challenge Match) fighter, Dr Tsuyoshi Chitose (Snr), known to students of Chito-Ryu as O Sensei. O Sensei became the Sixth Master of Tode, in a successive lineage that began with: the First Generation Beechin Chinen, who along with the Second Generation Beechin Matsumura, was a member of King Shokei’s Royal Guard, the Third Generation Uekata Awane was a member of King Shoiku’s Royal Guard, Fourth Generation was Beechin Hokama, and the Fifth Generation was Chitose’s teacher Sesho Aragaki. He was also under the tutelage of such luminaries as: Chotoku Kyan, and Kanryo Higaona. We never had the pleasure of meeting or training with O Sensei. We didn’t even start studying Chito-Ryu until after he had passed away, but throughout the years we have had the pleasure of training with a lot of his senior students who are now the current day masters of Chito-Ryu. Every year, we make a point of going to Japan and other countries around the world to continue our studies of Chito-Ryu. We have very close ties with Soke and his dojo in Kumamoto, Japan and he has introduced us to a lot of other senior Chito-Ryu instructors. We have also been bringing world leading instructors here to the Sunshine Coast every year since around 2004. Last year we had a the pleasure of hosting Soke & Higuchi Sensei. A couple of years ago, Noonan Sensei from Sydney got some great video footage of Soke and Higuchi Sensei’s visit to his dojo after they were on the Sunshine Coast. This gives a great indication of the kind of training that we do at the higher levels. 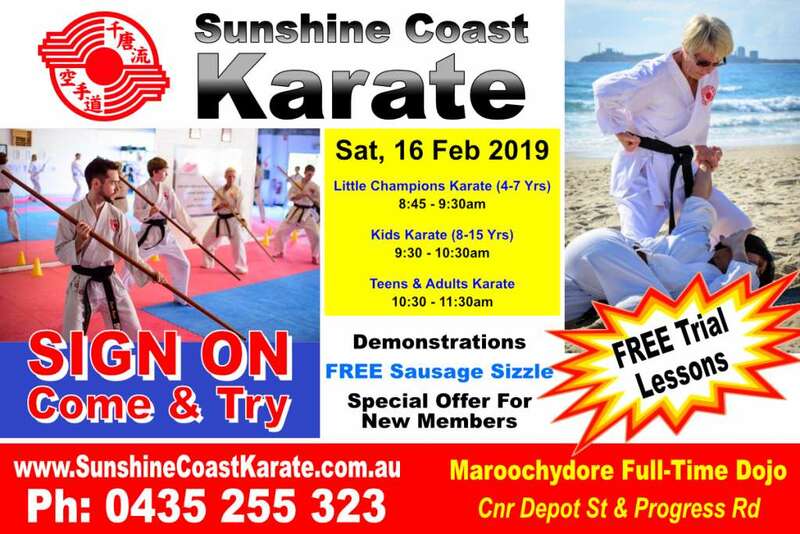 Chito-Ryu Karate is a rich style, with incredible depth in the senior ranks and we are very fortunate to learn from them and in turn share with the Sunshine Coast community. THE TRAINED EYE CAN SEE WHAT THE NOVICE CANNOT An incredible demonstration by the 2nd generation Soke of Chito Ryu, Tsuyoshi Chitose, performing part of his family kata. His father, Okinawan Karate Master, Chitose Snr, was one of the six originals to bring Karate to mainland Japan, he taught in Funakoshi Sensei’s dojo (although never practiced Shotokan). Chitose Snr a descendant of the Okinawan Royal Guard, was taught the techniques of Todi from childhood. On the mainland of Japan he pursued other Martial Arts’ legends, training with Mifune Sensei in Judo/Jujutsu, in Kendo with Nakayama Sensei and also with Aikido’s famed Ueshiba Sensei. He codified his learning in the style of Chito Ryu. Chitose Snr was renowned for his smooth flowing open hand techniques. Senior students of Chitose Snr still attest to his incredible power, a power that he said was generated through years of ‘tanden’ training. In this video, the trained eye will see this same power and the relaxed flowing movements that are characteristic of high-level Chito Ryu practitioners. Soke’s guard of honour at this demonstration was Shodai Naoyuki Chitose, Higuchi Sensei (7th dan Japan ?? ), Taneda Sensei (7th dan Canada ?? 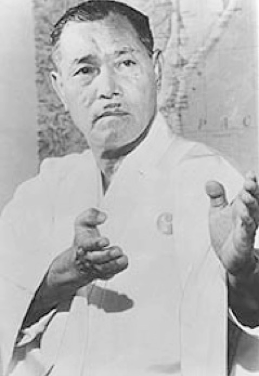 ), Noonan Sensei (7th dan Australia ??). Here is another video from Noonan Sensei, an incredible demonstration by the 2nd generation Soke of Chito Ryu, Tsuyoshi Chitose, performing part of his family kata at the 2017 International Chito-Ryu Karate-Do Championships (also known as, Soke Cup). Although, our teachers won’t be physically present at the upcoming Come & Try Day, you can have comfort in knowing that you will still benefit greatly from their teachings. Below is a poster sharing more details about our upcoming Come & Try Day. We would love to meet you on Saturday 16th February. If you require further information, be sure to connect with us. Learn more about our Come & Try Day on Facebook.